Gone are the days when people wanted to keep it plain and simple. Back then only few people had the privilege to buy fashionable designer clothes because of the price and availability. But today things are different. People now know the importance of fashion and everyone wants to look fashionable. Be it at workplace, party, wedding, picnic, vacation etc. fashion is now a part of life. With an increasing demand for fashionable wear, the designers are coming up with varieties of unique and elegant garments to suit individual fashion sense. If you are looking for designer clothes then you must surely have a look at Mydesignersales.com which has unique designs you would love. They have a wide collection of clothing for women starting from tops, chudidars, sarees, shirts, t-shirts, pants etc., men's clothing, accessories and many more stuff. Let's have a look at what the website has in store for us. 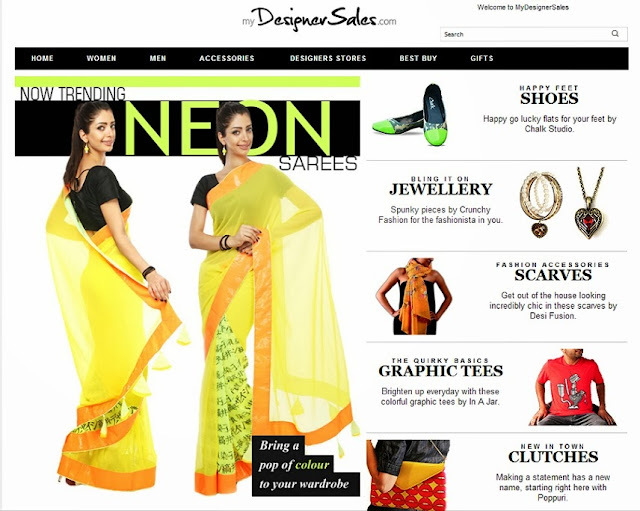 Neon Sarees are in current fashion and they resemble the color of love and feminity. My favorite in the collection of neon sarees at mydesignersales.com is pink georgette designer saree which looks simple yet vibrant. You must be well aware of the woman's wear brand Ethniche. It offers ready to wear as well as customized Indian ethnic and fusion wear. This website has a wonderful collection of Ethniche products. This ombre lehenga skirt in fuchsia and red is a real winner. The traditional colors of this outfit can make you stand out in a crowd. Starting from a college going girl to a party animal, everyone loves crunchy fashion jewelry. 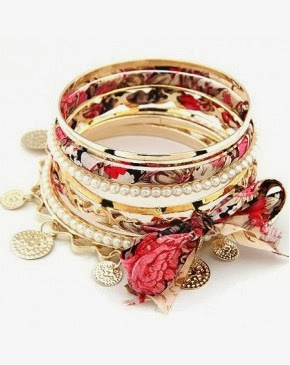 This multilayer bangles set is one of the wonderful collection they have. It looks trendy and fashionable. This multicolored sandals with a criss-cross front starp and ankle strap looks so eye catching. You can match it up with any jeans and top and look wow! The entire collection of accessories looks so different from what the rest of the online sites offer. Apart from the wonderful collection available at mydesignersales.com, they also offer free shipping with a secure online payment. Shop at their website here and get it delivered in 2-5 working days. They also have a 7-day return policy in case of any issues. Do explore the site and find your way around designs that are genuinely made only for you. I am bookmarking the site Lavanya! Never heard of this site. Looks useful. Looks great, love the neon saree! looks great...I like the saree..